Subdivisions: 3 arrondissements, 31 cantons, 226 communes. The department is named ("Eastern Pyrenees") after the Pyrenees mountains. The flag of Catalonia is widely used in the department of Pyrénées-Orientales, which matches more or less the northern part of historic Catalonia. The flag is hoisted, most often together with the French national flag and the flag of the European Union, on most town halls. It is also used on other public buildings but also on private houses, shops, as street decoration etc. The three flags are hoisted in the session hall of the General Council. There is an interesting sighting of the three flags in the small town of Saint-Genis-des-Fontaines, located between Perpignan and the border with Spain. The church of the former Benedictine abbey, today used as the parish church, is famous for its Romanesque cloister and gate's lintel, which is the oldest Romeasque sculpture with the date written on it, here 1019-1020. 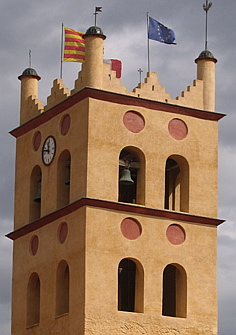 The church is dominated by two bell towers recently revamped, the highest of them hoisting the three flags of France, Catalonia and the European Union. This deserves mention because hoisting flags on churches is very unusual in France. The legend says that Charles le Chauve, Emperor and Charlemagne's grandson, visited his valorous vassal, Guiffré el Pilos (Geoffrey the Hairy, born in Ria in 852), at death's door in his tent. Near the litter was a plain golden shield. Charles le Chauve dipped his fingers in the dying' wound and designed four bars of blood, giving therefore a coat of arms to the house of Aragon, "Or four pales gules". Ria is a village located near the town of Prades, in the region of Upper Conflent. While the tradition says that Geoffrey was killed when fighting either a Northman or a Frank named Solomon, he was indeed killed in 897 at war against the Muslims. The flag of the General Council of Pyrénées-Orientales is white with the logo of the General Council in the middle. The logo uses the red and yellow colours of the Catalan flag and a design recalling the flag. The flag can be seen in several places owned by the General Council, such as the Palace of the Kings of Mallorca in Perpignan, the Royal Castle in Collioure, the site of Paulilles (a former dynamite factory located near Banyuls) and the natural site of Lake Bouillouses. Yellow and red bring balance and dynamism, while the square, the most universally used geometric figure, brings stability and perfection. The four accents in ascending progress recall the foundation of the Catalan state in the 9th century.